UNCASVILLE, CONN. – June 12, 2017 – Well-preserved and concours-level prewar classics are among the crown jewels of this year’s 2nd Annual Barrett-Jackson Northeast Auction, June 21-24, 2017 at Mohegan Sun in Connecticut. A reminder of America’s profound impact on the design and performance of the automobile, some of the best examples of prewar classics crossing the Northeast Auction block include a ’24 Marmon Model 34B Roadster (Lot #694) and a ’32 Hudson Roadster (Lot #695). 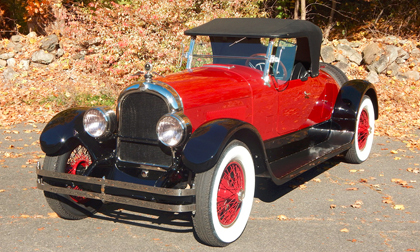 Among the notable prewar classics crossing the block is a ’24 Marmon Model 34B Roadster (Lot #694) in factory-new condition. Powered by a 339.7ci inline overhead-valve 6-cylinder engine mated to a 3-speed manual transmission, this burgundy Marmon has been beautifully finished from a full body-off restoration. It is a simple, elegant and functional example of a roadster from the Golden Age of automobiles. Lot #695 is a 1932 Hudson Roadster that was recently discovered and restored to its 1932 Paris Auto Salon-show status. Finished in Dark Midnight Black with stunning orange accents, it is powered by a 254.4ci inline 8-cylinder rated at 101hp mated to a 3-speed manual transmission. This Hudson can be considered the ultimate in rarity, provenance and exquisite design. Also among the highly desirable prewar classics on the docket for the Northeast Auction is a ’34 Packard 1104 Super 8 Roadster (Lot #698). Powered by a 385ci straight-8 engine and 3-speed manual transmission, this Packard is an authentic example of the Super 8 chassis and is a Classic Car Club of America (CCCA) Full Classic.